Today the Department of Jobs, Enterprise and Innovation (DJEI) launched its Framework for the Development of Regional Enterprise Strategies. It includes many sensible ingredients. The Regional Enterprise Strategies are to be developed ‘bottom-up’, with the key regional stakeholders, such as local authorities, regional bodies, higher education institutions, other public bodies, the private sector and communities, working collaboratively across the region. In addition, it is recognised that economic activity is not confined to administrative boundaries, and that it is important that the Regional Enterprise Strategies address synergies for collaboration between the regions. That is, the Regional Enterprise Strategies should fit into cross-regional frameworks. The Framework will be applied to regions designated at NUTS III level (the former eight administrative regions of Ireland). The DJEI recognises the need to examine alignment of the current regional structures of Enterprise Ireland, IDA Ireland, Universities and Institutes of Technology, and the regional operations of the Department of Social Protection, SOLAS and the Training Boards, with these NUTS III regions. With this document, DJEI takes a proactive approach in the development of regional development policy and related governance structures. Unfortunately the Department of the Environment, Community and Local Government (DECLG) acts less fast and the actions of DJEI happen in the absence of an overall regional and national spatial planning strategy and regional tier of governance. The role of the 2002 National Spatial Strategy (NSS) was seriously undermined by Phil Hogan who stated, in February 2013, that the National Spatial Strategy (NSS) was to be scrapped and replaced by a new policy in about a year’s time (see here). Proposals would be brought to Government later that year for a roadmap to develop a successor strategy but we are still waiting. The Regional Authorities and Regional Assemblies were abolished in 2012 as part of the Action Programme for Effective Local Government. These were to be replaced by three Regional Assemblies (see here). Two-and-a-half years later we are still waiting. The idea is to have a successor National Spatial Strategy. This will provide a framework for the development of Regional Spatial and Economic Strategies, under guidance of the new Regional Assemblies. This should guide regional strategies and frameworks of other departments, including those of the DJEI and its agencies. The Regional Spatial and Economic Strategies should, in turn, act as the framework for the development of Local Economic and Community Plans by the Local Authorities. But the actual situation is rather different. Some local authorities proactively started developing Local Economic and Community Plans (and bottom-up governance structures), in the absence of any guidelines or regional framework. The guidelines were developed kind of retrospectively, incorporating what was happening on the ground in various local authorities. The Regional Framework and the Spatial and Economic Strategies will follow later, hopefully in 2015. And successor National Spatial Strategy, the overall framework, will follow after that. We are backward engineering our regional and national frameworks. There is a difference between ‘bottom-up’ and ‘in-reverse-order’. The recent closure of the Smithwick’s Brewery in Kilkenny City has end over three centuries of brewing tradition on the sixteen acre site. Its purchase by the local authority presents a once in a century chance to enhance the economy of the region and the liveability of the city. The Council are to be commended for purchasing the land at such a low cost. However, that was the easy part. Now begins the real work. The whole place is dripping with heritage. However, heritage on a construction site is usually the last thing any developer wants to see. Clean, green, locations have few surprises and require less brain power to develop. Such sites provide the best opportunities to design easily, get planning, construct, and make a profit in as short a timeline as possible. This approach is certainly understandable, especially if you are the one paying. Heritage can add value but usually it is perceived to be not worth the trouble beyond a marketing driven sop. Typically, it is only in the highly developed marketplaces of major cities that heritage attributes are fundamentally incorporated into the design of a development. In these markets, heritage can be a key distinguishing factor that adds exclusivity and helps create a memorable experience. It is these latter developments that add positively to a city over a long period. Kilkenny is a relatively small place. However, it is a small place that can think big. The Council obtained the Brewery Site at a bargain price. This allows the pressure for quick returns comprising crass buildings to be somewhat relieved. There is time to reflect. It is interesting to note that the city’s best spaces and buildings are almost all hundreds of years old. That is the timeline that should be thought about when planning the future of the site. These are also the places that have led to Kilkenny being such a great place in which to live, work, and visit. Plainly, the heritage of the Brewery site will be central to the long term success of any development. Unfortunately, despite having some interesting ideas about the reinstatement of medieval burgage plots, the current masterplan lacks creativity when addressing the past. This is not surprising given that there was no obvious heritage professional on the project team. Thankfully though, there is time to amend the document. In the current plan, archaeological finds are listed as an opportunity. Despite this, during a recent public consultation meeting I got the feeling that some senior Council staff saw archaeology as a threat. According to this perspective, archaeology is best avoided, not so as to conserve it, but because it costs money to remove and does not add value. Nowhere in the masterplan has the possibility of having an exciting urban excavation open to the public been entertained. In York, thousands visited the Viking dig. Elsewhere in the UK, at the Roman fort of Vindolanda, 100,000 tourists pay each year to witness archaeologists peel back the soil. Hundreds more pay to dig. Currently, very little is known about the nature of the Brewery Quarter’s archaeology. Despite some previous disturbance, it is likely that the archaeological deposits are extensive, dense, and deep. Clearly, more information is needed to enable a well thought out redevelopment. If this has to be conducted, is it not better that archaeological investigation is embraced and used as an opportunity to increase both the number of visitors to Kilkenny and their length of stay? Nowhere else in Ireland would there be an urban excavation open to the public. It would also bring added authenticity to the Medieval Mile marketing initiative. The Council themselves admit that the site will take years to fully develop. All this offers the possibility for a large scale excavation to occur over two or three extended summers. Such a dig would attract tens of thousands of tourists to the northern end of the city. Finds could be stored and displayed securely in the Brew House. A pop-up museum such as the one on the Parade last August has shown the public’s thirst for archaeological knowledge. In just four days 3,200 people visited. Learning about a place and avoiding archaeology for construction is one thing but how about using the information? In the Rocks district of Sydney there is a four storey 106 room youth hostel built over one of the most important archaeological sites in Australia. Constructed on steel columns, the hostel hovers over the archaeological deposits. Like in Kilkenny, the landowner was the local authority. For many years they had identified the then derelict site as a place of high development potential. It was also place that if its potential was realised would rejuvenate an area which was underperforming. In 2006 they put out a call for suitable proposals on how to develop this archaeologically sensitive place. The judging panel – which was dominated by heritage professionals – chose the youth hostel (YHA) project. A 99 year lease was then granted. An excavation that had been partially undertaken in 1994 was restarted. The dig was halted when the archaeological research questions were answered. Throughout the whole project heritage professionals were at the heart of the design process. The excavation informed every aspect of the build. On several occasions steel columns were moved to avoid newly discovered archaeological deposits. Ultimately, only 10% or so of the remaining archaeology was removed to make way for the 4,700msq development. Today, the whole building permeates with its past. The central atriums of both blocks look down on to archaeological remains, tourists walk along reopened historic laneways, and tens of thousands of students go to the education centre to learn about early Sydney. Overall, the Rocks YHA is a massive success, not in spite of its heritage but because of it. Imagine a similar approach taken to the abbey of St. Francis and its extensive medieval wall foundations that lie under the concrete slab. During a recent public consultation meeting there was much made of the removal and retention of existing buildings. It was disclosed that the Brew House and the former Mayfair Ballroom were to be kept while all other unprotected buildings would be removed. In order to aid transparency the report upon which these decisions were made was released. Unfortunately though, instead of clarifying issues, the report has perhaps muddied them. How, for instance, is a 20th century former ballroom worthy of keeping while a 19th century oratory listed on the National Inventory of Architectural Heritage is not? Similarly, the brewing equipment in the Brew House is marked for full removal even though it is this same equipment that the building was constructed to house. Surely, this wholesale removal radically reduces the importance of the building? Overall, there may be very good reasons for the recommendations of the report. However, these are not obvious when reading the document. Certainly, many of the tanks and piping in the Brew House will have to be moved for the building to be made useable. However, by taking out everything, the chance to create interesting and special internal spaces is massively reduced. More imagination is needed. Items that are deemed not suitable for retention in the building should be considered for use elsewhere on site. During the redevelopment of the Carlton and United Brewery in Sydney, a survey was undertaken by heritage consultants and an artist to assess the possible use of industrial heritage components for art pieces in the new residential and commercial blocks that were on the way. Closer to home, Lough Boora, Co. Offaly, has shown how the reuse of seemingly useless industrial artefacts can add significantly add to the distinctiveness of a place and its ability to act as a tourist attraction. Similar actions could take place here. The possibilities presented by the Brewery site are almost overwhelming. However, no matter what the area is used for, the true incorporation of the site’s heritage into its redevelopment must be done. To do otherwise would undermine the uniqueness of the site, and its ability to significantly improve the economy and liveability of the city. Bad places are cheap. Good places that provide a sustained long term benefit are not. That is the choice Kilkenny – the Medieval Capital of Ireland – has to make. This article appears in an edited form in the current edition of the Kilkenny People. Privatizing public transport from the periphery to the centre? In late January, the Irish Times reported that the Fine Gael Minister for Transport Paschal Donohoe was pressing ahead with the privatisation of a number of Dublin Bus and Bus Éireann routes. This is a proposal that has been doing the rounds for years. It has been part of at least three government programmes since 2007. Having failed to convince the drivers’ unions of his plan, Donohoe is now putting 23 Dublin Bus routes and 5 Bus Éireann routes out to private tender. From a geographic perspective, this plan is of interest because part of the proposal is that no privatised route will “terminate in the city centre and are primarily orbital routes, or services carrying commuters from rail stations or large shopping centres to suburbs”. Why is this? What is the rationale for doing it this way? It will not take long but this is part of a plan for wholesale privatisation, working inwards from the city’s periphery to the centre. In this post, we want to briefly examine the geography of the Dublin Bus routes considered for privatisation. We examine the demographics of these ‘orbital’ areas. 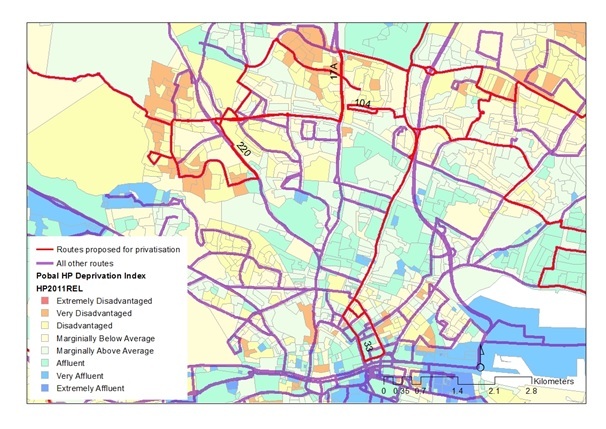 It is an attempt to understand the politics of this transport policy and to see if there is a relationship between these routes and specific socio-demographic indictors. We use CSO/AIRO maps at small area and electoral division levels to examine what public is served by public transport. These districts are generalised census units which aggregate a large amount of information in a single measure. All of the routes proposed for private tender serve suburban locations, albeit very densely populated ones. In the absence of route-specific passenger load data (a vital part of commoditisation), it can be argued that some of the routes proposed for privatisation have been in decline since the early part of this decade. For example, routes 63 and 75 serve many of south Dublin’s affluent areas where travel by private car is more usual. 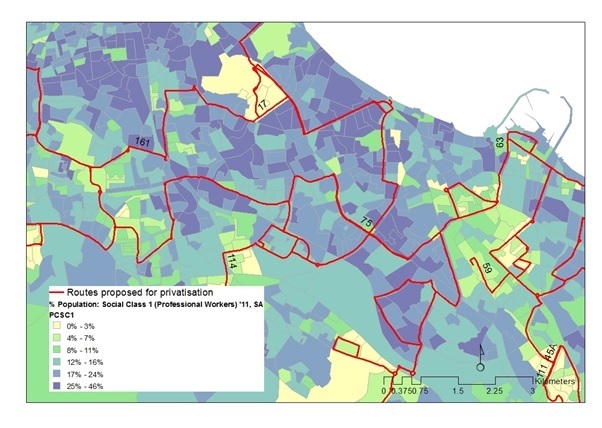 The map below shows a part of Dublin’s suburbs alongside the percentages of Professional Workers in each area. 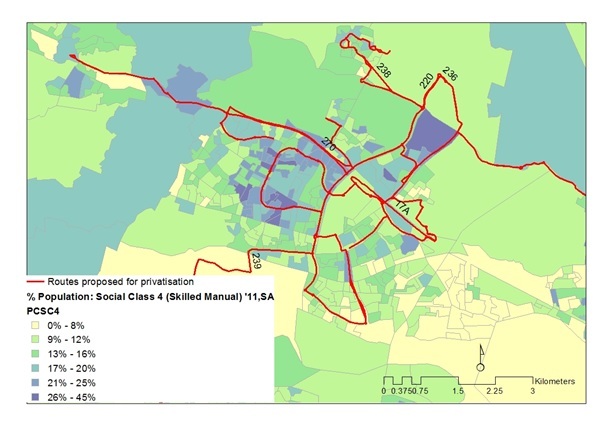 The map shows how the routes proposed for private tender travel through areas of relative affluence in terms of social class. A map for private car ownership (a basic proxy for affluence) yields broadly similar results. Routes 63 and 75 travel through this affluent and car dependent part of south Dublin. How will private tenders operate in areas of higher car dependency and among those in higher social class groups? If the imperative is to profit and not service, what attracts a private operator to these routes? Looking at Blanchardstown, a western suburb, a number of routes are proposed for privatisation. The map below shows the percentage of an area’s population in the skilled manual social class. Areas that are soon to have privatised bus services have up to 20% of their population in this class, arguably those most in need of mass transport. Finally, and in the same area, the areas with many households with access to two cars is relatively higher in the south when compared to the area north of the main road (indicated by routes of the 270 and 17A). Using the All Island Deprivation Index data for the north city area, we can see that the 17A and 220 routes serve areas of high disadvantage but that these are served by other bus routes. 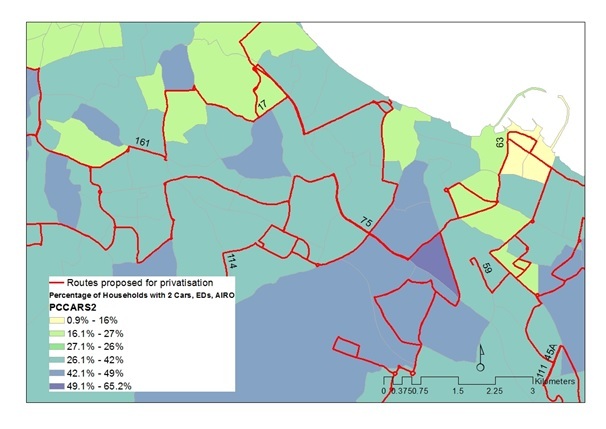 In Blanchardstown, the 236 and 200 routes proposed for privatisation serve areas of relatively high disadvantage. While the routes proposed are said to be ‘orbital’ they serve tens of thousands of people travelling to and from work, retail and education every day. To whom they are orbital is only a consideration to a network and its planners that makes the city centre the terminus for most routes. What is being achieved by the proposal of these routes to be sent for private tender? At an initial glance, it seems that there will be differential effects across the city. In the southern suburbs, where two car ownership is higher than other parts of the city, a less frequent privatised bus service will matter relatively little. In areas where the bus is the only form of frequent transport, operating routes on the basis of something other than profit is a social good. It forms part of a social wage. Along with the recent contraction of schedules and the number of vehicles, certain areas of Dublin are now more dependent on this service when compared with others. A privatised route will have to generate income and to do so can only increase fares and / or lower wages. We have seen this for refuse collection since 2001. Taking the city as a whole, the private tendering of these ‘orbital’ routes is a testing ground for more extensive privatisation on other, more lucrative, routes in the years to come. A private operator is not going to want to compete on one route but on many across the entire network. If a route is operated by a profit-driven company, the license to service the route will need to stipulate the regularity of the service. A route that runs at peak times only and does not operate outside of this peak defies categorisation as a social good. Ours fears for privatisation is that there will be a focus on running a bus only on that exact slot in the schedule that will be busy. There is little assessment of the route within the system as a whole. Having operated a route for perhaps two years, private operators will be back at the minister’s office door arguing for access to these more lucrative routes.